This blueberry Jell-O salad recipe is a fun variation from the original Jell-O salad. It's the perfect side for picnics, parties, and barbecues. In a large bowl combine Jell-O and boiling water. Stir until dissolved. Mix in pineapple and pie filling. Pour into 9x13 inch pan and refrigerate about 2 hours until firm. Topping: Mix cream cheese and sugar together well. Stir in Cool Whip. Spread over set Jell-O. Refrigerate at least half an hour before serving. 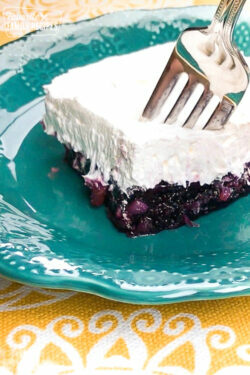 This recipe is also yummy using cherry Jell-O and cherry pie filling!